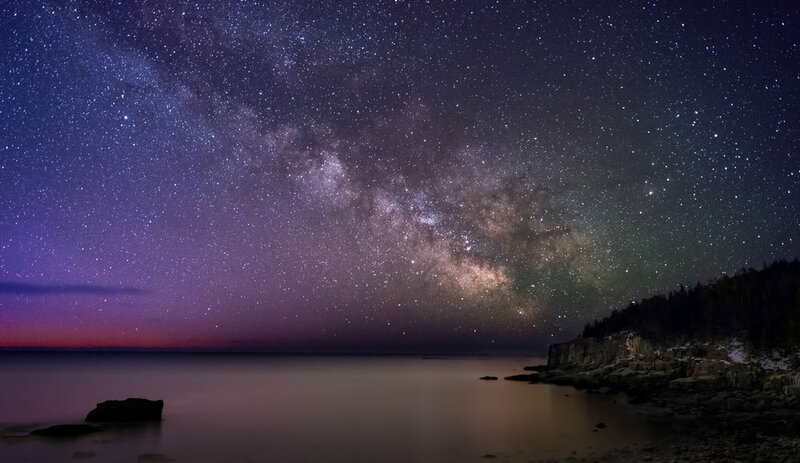 Low-tide, sunrise, new moon, and clear skies resulted in a fortunate evening to capture this image of the Milky Way at Otter Cliffs in Acadia National Park. I headed out at 3 AM and temps below 20° F (windy too) with a vision of incorporating the Milky Way at sunrise. This is a blend of three images: the stars, the foreground, and the sunrise. Pre-visualized with PhotoPills using 'Night AR' mode. 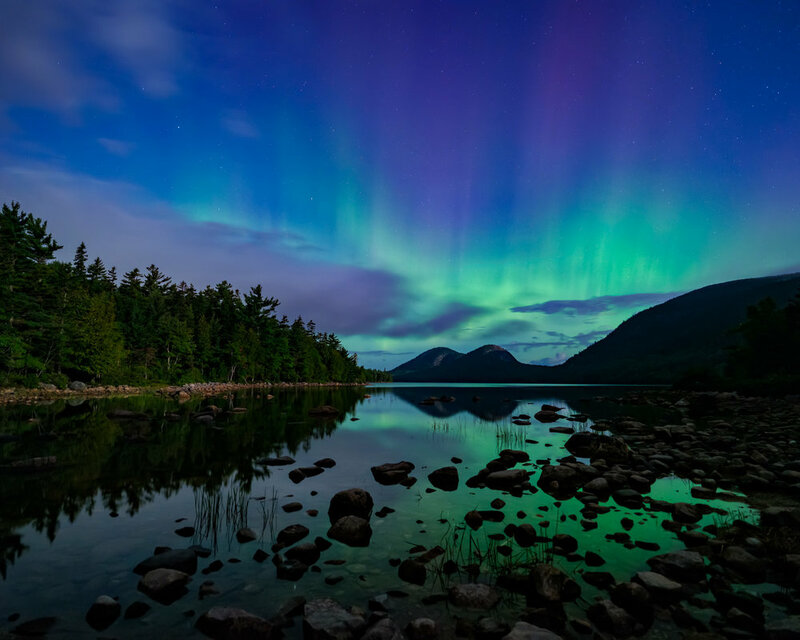 To learn how to create images like this, consider attending one of my landscape photography workshops in Acadia National Park. Today's forecast called for partly cloudy, changing to cloudy, changing to BIG storm (gale force winds). Yesterday, noting that the lagoon in front of the Beehive was filled with water, I hoped to capture the scene with clouds, golden-light, late foliage, and reflections. A small 8-minute window of light allowed for this shot. Afterwards the clouds concealed the sun shading the Beehive. A shot of yesterday's aurora, even though it was against the odds. Sometimes you get lucky when there is a strong aurora forecast, a full moon, and clouds. Not a perfectly clean aurora image, though mood evoking ... I like 'dark and moody'. A noticeable aurora, great foreground reflections in the water, purple clouds, the western shoreline bathed in moon light, the Big Dipper, and if you squint (or enlarge the image) you'll notice that the Bubbles have a moonlit strip. Am I reading too much into this image? Oh I think not! Everything was unfolding for a quintessential sunset: low hanging clouds and a gap for the sun to sneak under the clouds. Captain Brenda piloted our boat to place Buoy #10 (just off Bear Island, near Northeast Harbor, Maine) in the foreground with the western Acadia National Park mountains in the background. And then we waited for dusk, a few minutes after sunset, for the clouds to light up with beautiful fuchsia highlights that reflected in the water. For a bonus, the red buoy light is on in the shot. This was taken during our Sunset Cruise Safari, needless to say everyone was please to see and capture this scene. Yet another image of the much over-photographed Bass Harbor Lighthouse. With Tuesday's two feet of snowfall followed by yesterday's ten inches, I thought the snow might add a bit of interest to this iconic scene. I setup for the classic shot of the lighthouse reflection in the tide pool. After the sun dropped beneath the clouds, I noticed the waves and rocks bathed with golden light. Quickly I moved my tripod to incorporate the snow, waves, and sunset for a better than average scene. 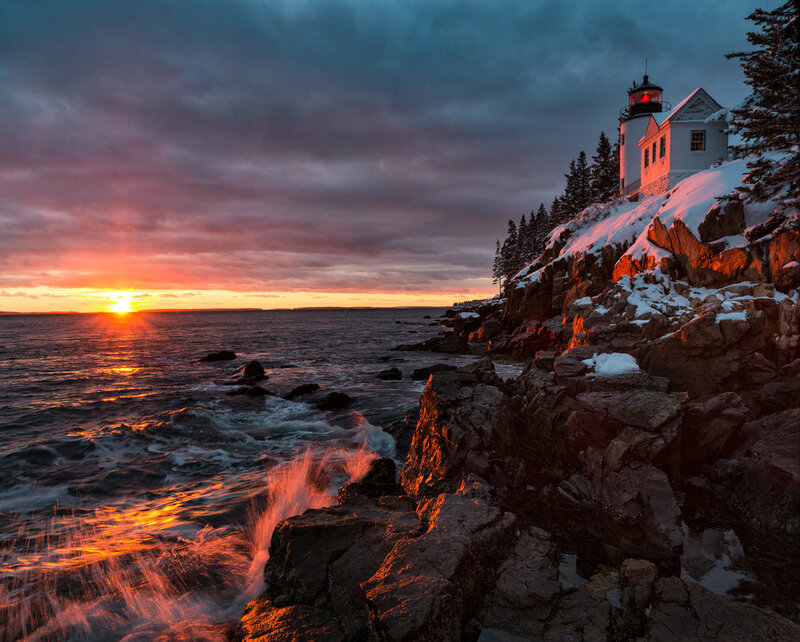 To learn how to create images like this, consider attending one of my landscape photography workshops in Acadia National Park.